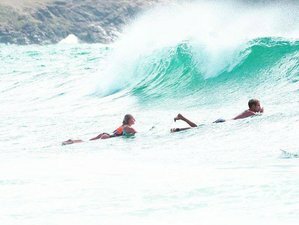 Discover and be part of a unique surf experience in two major surf spots in Australia. Get your surfing to the next level in an amazing surf camp in Coffs Harbour and Byron Bay, while having time to enjoy the Aussie lifestyle and hang out with the crew and your new friends. After 11 days of surfing, you will really be getting the hang of it as well as you will truly be on your way to becoming an intermediate surfer. Get ready for adventure, surf some waves, and live the Australian dream. Spend your first 7 nights at our legendary Spot X Surf Camp in 4-12 share mixed dorms or 4 share tipis, immerse yourself in the Aussie surf lifestyle and take your surfing to the next level. Spot X has all the facilities including laundry, cooking area, a shop for all your basic necessities, an entertainment area with internet access, a tour desk, television and Digital Versatile Disk, a kick-*** sound system, bean bags, hammocks, a volleyball court, a pool table, and communal areas to hang out in. After 8 days at Spot X you will then head to the cool town of Byron Bay where you will spend the next 2 nights in tipis (or dorms during winter) at the Mojosurf Camp Byron Bay. This itinerary is for Sydney to Byron Bay trips and is subject to change. These trips are also available in reverse or boomerang (return to departure point), or to start and end in Brisbane (add $33 from Brisbane). Please note that Sydney boomerang trips will just stay at Spot X for the entire trip. During this day, you will head out to the northern part of Sydney to the legendary beachfront surf camp, Spot X. Depending on the weather conditions, the group might stop on the way for a quick surf. Upon your arrival to the surf camp, you will check-in, chill out, and hang out with your new friends around the campfire. Lunch or dinner will be served on this day, depending if the group stops along the way for a surf session. You will spend the next six days, twice a day, learning how to surf from the professionals. You will be served with three delicious meals a day, which will give you loads of energy for hitting the waves. Even if you are a complete beginner, the instructors will cater for all levels and will have you riding a wave in no time. Between the two surf sessions, there will be a lot of fun with plenty of other activities that will be offered around the camp. During this day, you will be served with breakfast, lunch, and dinner. After surfing in the morning and receiving your lunch, it will be time for you to hop on the bus and head to the famous town of Byron Bay. Upon arrival, you will have time to check-in at your accommodation, have a delicious dinner, and hit the town Mojo style. On this day, you will be served with breakfast, lunch, and dinner. You will get up early for breakfast and receive your surf lesson with the Byron Mojo team. You will have a free afternoon to explore the town, relax on the beach, or hang at the camp. At night, you will get ready for a night out with your friends and the Mojo crew. During this day, you will get up early to have a last breakfast. You will proceed to your check-out and receive your last surf lesson. At this point, you will have the option to stay longer in Byron Bay or head off to your next destination. These places are totally devoted to the surf lifestyle, as well as they are known not only for their great surf waves, perfect for rippers or beginners, but also for its amazingly laidback lifestyle and its cool surf culture. With long days in the sun and the waves, leading to memorable nights around the campfire, Spot X, its great food, awesome staff, and comfortable, clean, accommodation is truly a place you will not want to miss. During this camp, you will be served with one lunch or dinner on the first day and nine buffet breakfasts, eight lunches, and seven dinners in the surfing accommodations at Arrawarra Beach and Byron Bay. Bookings made within 48 hours before arrival will not be accepted.